Blog writing for your audience is key to effective content marketing. If your blog writing misses the mark, your readers won’t engage with your content. This means your blog strategy needs a re-vamp. Today you’re teaching a history lesson to a fifth-grade class. You usually teach twelfth-grade students. You’ve developed your teaching skill set for twelfth graders. So when you begin your lesson with the fifth graders, you teach in a style you know. But you find the fifth graders show zero interest. The students get nothing out of your lesson. And you’ve wasted a whole day of teaching. A lose-lose situation. This is what blog writing for your audience is like. If your content is missing the mark, you’ll lose the interest of your readers. Meaning you’re not reaping the benefits of your hard work. How can we tell if blogs are hitting the mark then? Here’s how to determine if you’re tailoring blog content for your audiences. You know your customers. But do you know how you’re communicating with them? Communication style is an important factor in writing for your audience. Think about the substitute teacher example and apply it to your blog writing. If your communication style doesn’t match your readers, it creates a disconnect. Pagezii analyzes blog content based on reading ease and content complexity. Using this analysis, it classifies blog communication style by Reader Profile. 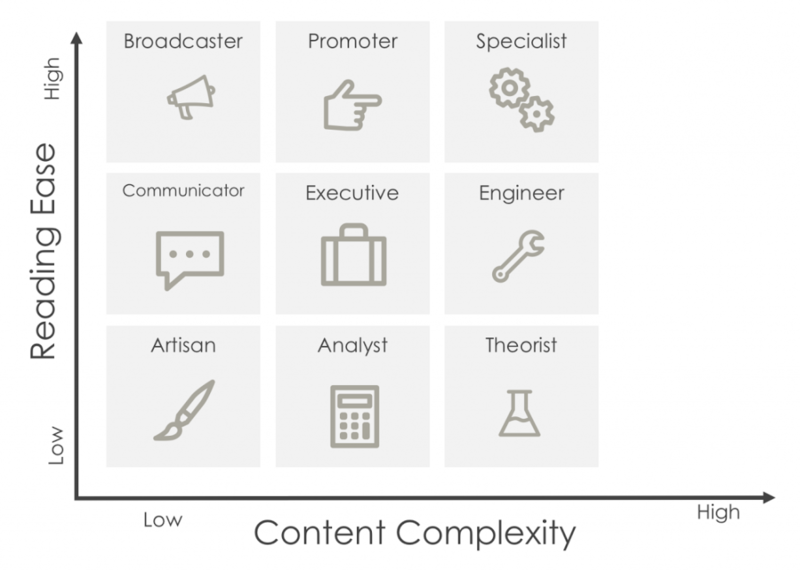 Depending on how you write, your blog content falls under one of these profiles. Behind Pagezii Reader Profiles: Pagezii Reader Profiles classify various communication styles based on reading ease and content complexity. Reader Profiles are inspired by standard readability tests (e.g. Flesch-Kincaid, SMOG, Gunning Fog, Automated Readability & Coleman-Liau) to grade content in a systematic manner. 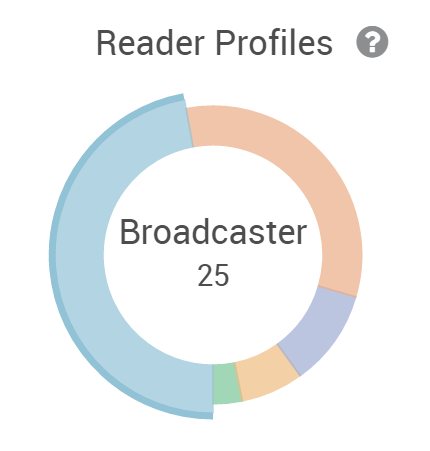 The Blog Pulse report shows your Reader Profile breakdown. This data shows how you craft a majority of your content. Now you know your blog communication style. But is it the right communication style for your readers? Reader Profiles shows how you’re communicating. Now it’s time to apply this information to the audience you’re writing for. Certain Reader Profiles are effective for getting different message types across. Here’s what Reader Profiles you should aim for depending on your audience. Broadcaster, Promoter, and Communicator: Posts have a direct and easy-to-digest message. The style works well for informational posts meant for quick reading. Executive and Analyst: Content covers complex subject matter in a standard tone. This style works well for posts targeting business professionals. Artisan: These posts use complex sentence structure to discuss content. This style of writing works well with startups, creatives, and entrepreneurs. Specialist posts: This style uses simple language to describe complex subject matter. It works well for instructor-style content. Engineer and Theorist: This style is typical of a technical or an academic blog discussing advanced subject matter. Different Reader Profiles work for different content types. Keep this in mind when tailoring your content for your readers. Have a tip you want to share for tailoring blog content? Share it with the community in the comments below!